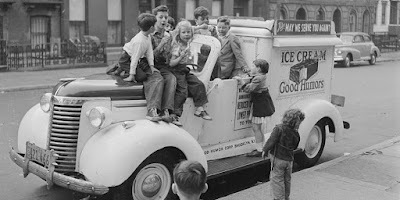 As seen in a Country Living magazine article here: 7 Fascinating Facts About the History of Ice Cream Trucks: Americans have long loved the ritual of buying a cold treat on a hot summer day. It is the song that has launched children into action for generations—as soon as they hear the twinkling sound of "Pop Goes the Weasel" or "The Entertainer," children abandon playground equipment or pick-up ball games, and race to catch the ice cream truck. The history of ice cream street vendors dates back to the nineteenth century and is shaped by advances in technology, and fortunately, sanitation.While much has changed since peddlers first sold dishes of ice cream from carts cooled with ice blocks, for the last few generations, not much has changed about the ice cream truck. I scream, you scream, we all scream for The Ice Cream Team! 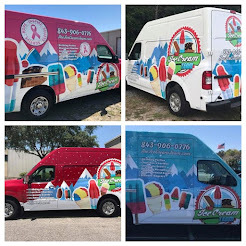 Traveling all throughout Charleston and Berkeley County, SC, The Ice Cream Team, a locally owned and operated ice cream truck catering service that delivers delicious and convenient pre-packaged novelty ice cream treats to corporate functions, parties, weddings, and events of all kinds! 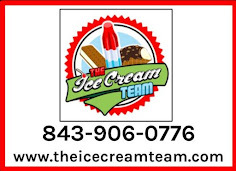 You can not find a more Safe, Affordable, and Family-Friendly option than The Ice Cream Team. 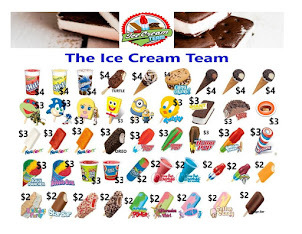 They offer several different professionally-run ice cream trucks to choose from and as far as ice cream goes, they’ve truly got the best stuff. Blue Bunny, Good Humor, and Popsicle, and not to mention the over 65+ other delicious choices. What sets The Ice Cream Team apart is that they're out to please everyone, including those who avoid sugar, gluten, and dairy, because they’ve got sweet substitutes that satisfy. They even win over the adults too, with unique SnoBar adult ice pops that fuse the boozy fun into ice pops. And this is ice cream you can feel good about eating, too. Not only can they make your next fundraising event a FUNdraising one, they're also giving back to the community through a variety of charities. The Ice Cream Team was honored to serve ice cream to our hard working friends at 5 News today. Apparently, the employee appreciation event was a hit! Is your boss as cool as their boss? 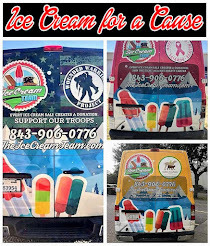 Ice Cream for a Cause! The Lowcountry's ONLY Locally Made Adult Popsicle! Copyright © 2005-2019 ~ The Ice Cream Team® - All Rights Reserved - Charleston, SC Area. Awesome Inc. theme. Powered by Blogger.